There are many reasons why a Texas couple may choose to move forward with divorce. No matter how long you have been married, there are a number of factors that can cause problems and eventually lead to the decision to divorce. This is also true for couples over the age of 50. When an older couple divorces, it can be especially complex and difficult to navigate the issue at hand. There are fewer opportunities to recoup financial losses, especially if you or your spouse retired. Additionally, there can be significant assets, some accumulated over decades together, that a couple will have to address and divide. This is not easy, no matter how amicable the two parties may be. When facing the prospect of a gray divorce, there are many factors to consider. One of the most important issues will be the full protection of your future financial interests. Older individuals have a lot at stake in a divorce, and it is in your interests to be thoughtful and careful about the choices you make and the decisions to which you agree. Alimony is not necessarily a guarantee, and if you are eligible, you may not get quite as much as you hope. Divorce will impact your retirement savings, which may lead to a need to adjust your plans for the future. You might not be able to stay in your family home. It is important to consider if you can afford to stay there on your post-divorce financial resources. These are just a few of the issues that could impact your retirement, lifestyle and plans for your golden years. It is in your interests to think about the long-term effect of each choice you make. There is a lot on the line, but you do not have to face it alone. A complete evaluation of your case with an experienced family law attorney can help you understand how you can intentionally pursue a strong and stable post-divorce future. Gray divorce is complex, but you can seek an outcome that allows you to look to the future with confidence. The post Should there be an age that children are told they are adopted by law? appeared first on Stowe Family Law. The post Court IT meltdown: a sign of things to come? appeared first on Stowe Family Law. The Musée Mécanique (or Mechanical Museum) looked like something that belonged a century in the past—an effect enhanced considerably by the fog. Inside a large room with peeling paint and a crumbling ceiling was a collection of hundreds of very old mechanical toys, games, and other amusements. For example, there were dozens of automatons—machines in which small figures walk, dance, or otherwise move around when you insert a coin. There were fortune-telling machines, games to test your strength (the electric arm-wrestling machine was frighteningly strong), flip-card “movies,” a player piano, and all sorts of other mechanical shows and diversions. The amazing thing was that all these machines—ranging from the very campy to the very sophisticated—were fully functional. Admission was free, but nearly every machine required a quarter (or two) to operate it. The money was well worth it, though: you just can’t get this kind of entertainment anymore. In the days before electronic toys and games, designers accomplished some impressive feats of engineering and miniaturization using simple motors, gears, levers, and springs. The result was an arcade that, while lacking video screens and digital controllers, was much more interesting and engaging than a modern gaming venue. The point of dropping in your change was not, in general, to win anything; it was simply to marvel at the skills of the machines’ designers. The Musée Mécanique houses some of the last remnants of an amusement park called Playland at the Beach, which operated along San Francisco’s oceanfront from 1928 to 1972. When the park closed, a collector named Edward Zelinsky purchased its mechanical games from owner George Whitney, Jr. Zelinsky had already been collecting antique gadgets of this sort for decades, and had taught himself how to repair and maintain them. Shortly after acquiring the Playland machines, he put the bulk of his collection on public display in the basement of the Cliff House. He kept it going as a labor of love until his death in 2004, but his son, Dan, continues the work. The Musée Mécanique is now the world’s largest private collection of antique coin-operated arcade machines, and other than being updated to use quarters rather than the original pennies or nickels, the machines have kept all their original charm. Returning to the Musée in early 2002, I saw a sign on the window that troubled me. It said the museum was likely to close permanently within a few months. I talked with the manager about it, and then a few weeks later, read a more detailed account in a local newspaper. The story was that the building, which is managed by the National Park Service, was badly in need of renovation. Following the repairs, the park service wanted to put a more profitable business in the spot where the Musée had been. They hoped to construct a new building nearby at some point in the future that could house the Musée’s collection, but there were no funds at the time for such a building, and in any case, there was no other space available for the Musée in the meantime. Left with no home for the machines, Zelinsky was considering whether to put the collection into storage indefinitely or simply auction it off. When the newspaper article was published, public outcry was immediate and overwhelming. Within a couple of weeks, more than 20,000 people had signed petitions asking the park service to save the Musée—to assure it a temporary home, as well as permanent housing after the Cliff House renovations were complete. Shortly thereafter, a follow-up article reported the good news: the park service had assured the owners that they would find a way to keep the Musée open. 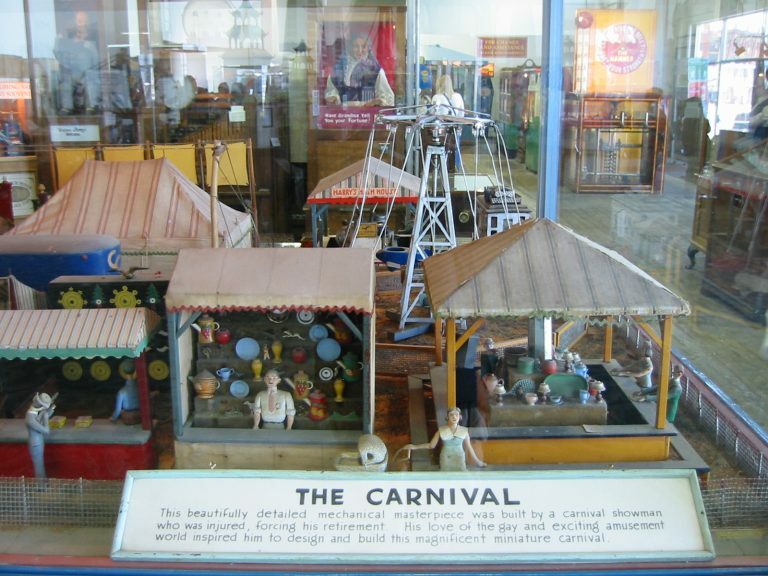 The Musée Mécanique is currently housed at Pier 45 on San Francisco’s Fisherman’s Wharf. The original plan had been for it to return to new digs at or near the Cliff House in 2004, but that never happened, and I suspect that the museum’s current home will be more or less permanent. The Fisherman’s Wharf location lacks the dilapidated charm of the Cliff House basement and is not nearly as foggy. On the bright side, it’s right in the thick of the city’s most densely touristy area, so it’s bound to attract more visitors. Admission is still free, but take a roll of quarters for a great value in entertainment—and nostalgia. Note: This is an updated version of an article that originally appeared on Interesting Thing of the Day on June 9, 2003, and again in a slightly revised form on November 4, 2004. Thomas Paine, one of the founding fathers of the United States, was born on January 29, 1736 (at least, as it was reckoned at the time; going by today’s calendars it would have been February 9, 1737). 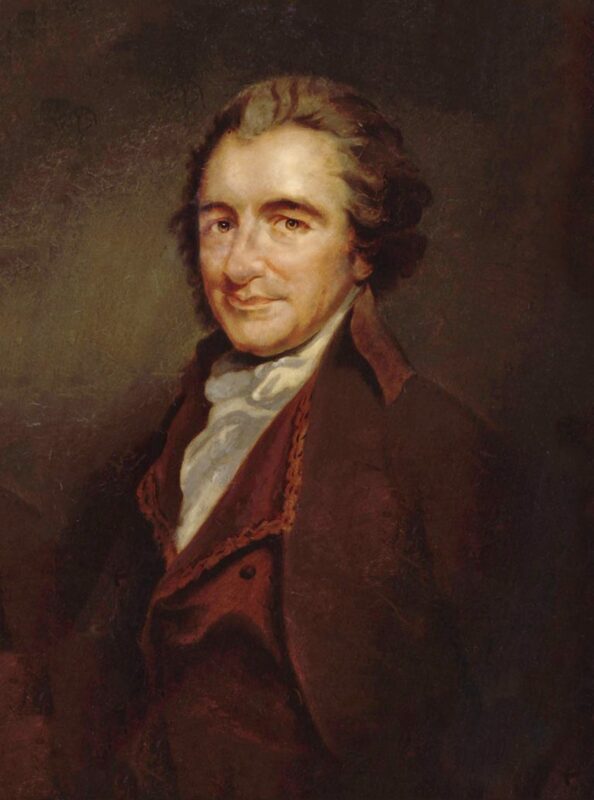 In any case, Paine was one of the main driving forces behind American independence from Britain, as detailed in his famous pamphlet [Common Sense](https://en.wikipedia.org/wiki/Common_Sense(pamphlet)_. He’s also popularly remembered as a freethinker. Celebrate his sort-of birthday by thinking independently! Getting a divorce can make anyone’s world spin. Whether it is a contested divorce or not, the process itself can cause many changes and concerns. And for Texas parents getting a divorce, this means determining a custody arrangement that benefits and child. It can be difficult to work through custody matters, often causing it to be a difficult and contentious divorce issue. While some divorcing parents seek primary custody of their child, it is possible to seeking joint or shared custody. In the eyes of the law, Texas parents are viewed as having equal rights to their children, and at Katie L. Lewis, P.C. Family Law, we understand this and fight for this for our clients. Whether you are a working parent or a stay-at-home parent, our law firm not only helps you navigate post-divorce life but also helps you develop a plan to help address any custody concerns. If you are asserting your right as a father, this may look like illustrating that you can provide adequate care and are capable of being involved in the child’s life. Our attorneys take the time to protect the rights of our clients while also ensuring that the best interests of the child are also met. To learn more, check out our law firm’s fathers’ rights website. Whether you are considering divorce, are going through the process or are dealing with post-divorce issues, it is vital to explore your rights and options. This will also help ensure that the rights and best interests of the child are best served. 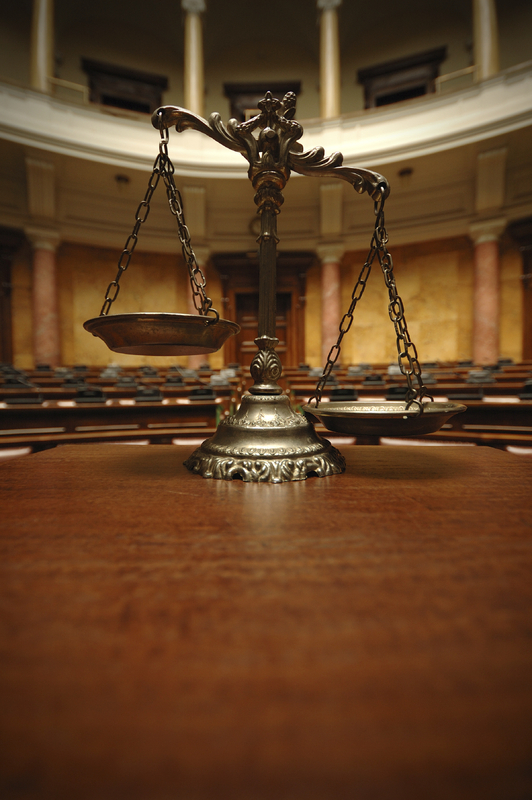 The post The view from our new President’s chambers appeared first on Stowe Family Law. One of the central paradoxes of scientific research and technological development is that while every new discovery brings previously unknown possibilities to light, these discoveries can also have negative effects that may not be readily apparent. For example, certain medicines may provide exciting new treatment options, but it’s only later that their side effects come to light. One of the most glaring examples of this was the thalidomide scandal in the late 1950s, when thousands of women took this drug to combat morning sickness during pregnancy, and it was later found to cause birth defects. Similarly, in the 19th century, opium was thought of as a cure-all before its highly addictive nature was fully understood. Along the same lines, Marie Sklodowska Curie’s discovery of the element radium in 1898 at first seemed to lead the way to a variety of novel medical treatments, but as the properties of radioactive materials became better known, radium’s health benefits came to seem more limited. Once added to everything from toothpaste to face cream, radium’s reputation went from cutting edge to dangerous within a few short decades. Marie Curie’s eventual discovery of radium was first set into motion by the research of French physicist Henri Becquerel, who noticed that materials containing uranium produced rays that fogged photographic plates. Looking into this phenomenon further, Marie Curie found that not only uranium, but also the element thorium, caused these effects regardless of their physical state (for example, dry or wet, crushed or solid), and from this deduced that the rays were part of the elements’ atomic makeup. She coined the word “radioactivity” to describe this property of these two elements, and along with other scientists of the time, opened the way to a new understanding that the atom was not the smallest unit of matter, but that even smaller particles (notably electrons) existed within it. Building on this information, and on her observation that two uranium-containing compounds, pitchblende and chalcolite, produced much more radiation than uranium alone, Marie Curie speculated that there were other, as yet unknown, elements in these compounds. 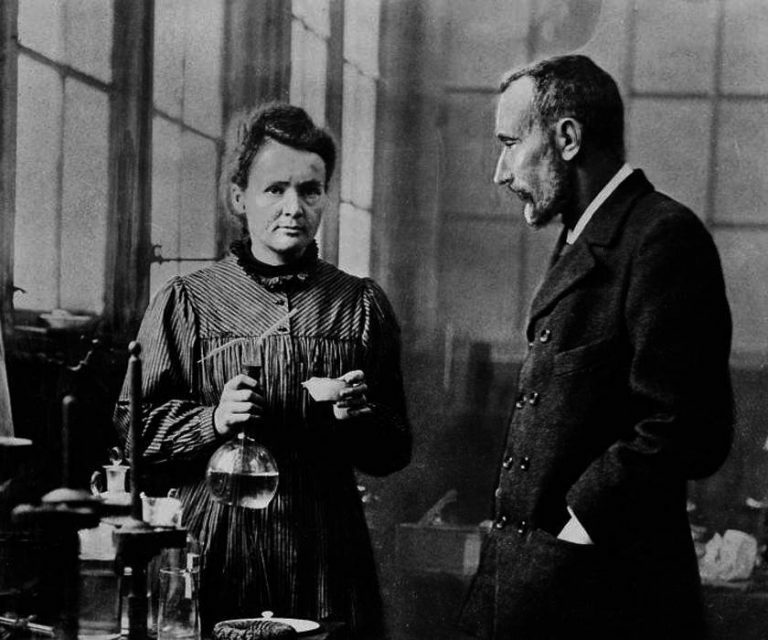 After extensive experimentation, aided by her husband Pierre Curie, Marie Curie was able to identify two new elements in pitchblende, which she called polonium (after her native Poland), and radium (after the Latin word for “ray”). Although the process of isolating radium involved processing a ton of pitchblende in order to obtain just a fraction of a gram of radium, even with similar levels of effort, the Curies found that it was impossible to isolate polonium. Later on, when the principle of radioactive decay was developed, scientists realized that the short half-life of polonium—138 days—was the reason for this problem. With the help of industrial partners who could produce radium much more quickly in their processing facilities than it was possible to do in the lab, the Curies began to develop new uses for this marvelous material. However, the Curies never became rich because of their discovery, but as a service to the scientific community and the rest of the world, freely shared their method of obtaining radium. One of the first uses of radium was as an anti-cancer treatment, owing to its observed ability to damage tissue. The resulting treatment, known as Curietherapy in France, and radiumtherapy elsewhere, is still used in some instances to treat cancer today. However, as with any health fad, there are those who take it too far, usually for financial gain. Because radium was seen as providing health benefits in one area, its use was expanded to other areas for which there was no proven benefit. This was especially the case in the 1920s, when advertising campaigns for face creams with names such as Tho-Radia and Radior claimed that “the amazing Energy of Radium has proved a boon to the human skin.” What purchasers of these products didn’t realize was that the “glow” they were seeking was not necessarily the kind they would actually receive. In fact, the luminescent property of radium was precisely what made it attractive to manufacturers of clocks, watches, and other technical instruments, for whom its glow-in-the-dark ability was commercially advantageous. However, the use of radium-based paints for such applications was eventually found to be extremely dangerous, after many workers exposed to the paint died from the effects of radiation. The growing awareness of radium’s toxicity made it seem less and less suited to general use, and when Marie Curie died in 1934, it was speculated that her exposure to radiation played a part in her death. Scientists now know that radium damages bone marrow particularly, because the body treats it as calcium, depositing it in the bones and providing it easy access to the marrow. Although the benefits of radium fall far short of what it was once believed it could do, with careful handling radium still proves useful in medical treatment and scientific research. In addition, the story of its discovery is inspiring and laid the groundwork for many other important advances in science (If you’re ever in Paris, I highly recommend a visit to the Musée Curie, where you can see the actual office and lab used by Marie Curie in her later experiments). But the next time you hear something being praised as a miracle cure-all, remember that the truth may be more complicated than it seems. Note: This is an updated version of an article that originally appeared on Interesting Thing of the Day on January 30, 2008. Since 2008, January 28 of each year has been Data Privacy Day, an occasion for learning about the numerous threats to the privacy of your personal data and what you can do about them. It so happens I’ve written an entire book on this topic: Take Control of Your Online Privacy. It tells you who’s after your personal data and why, what you should (and shouldn’t) worry about, and what concrete, practical steps you can take to protect yourself without withdrawing entirely from the online world. I hope you’ll check it out! Dry surfing or hot snowboarding? It was in a high school English class that I first ran across Emerson’s famous quote, “A foolish consistency is the hobgoblin of little minds…” Something about that struck a chord with me, and ever since, I have tried to nurture a healthy appreciation for paradox if not outright contradiction. For example, as I may have mentioned, sports are not among my top thousand or so favorite things in life. So I was chagrined to discover how many of the suggestions I received for topics to include on Interesting Thing of the Day were sports-related. Someone would very excitedly come up to me and say, “Hey! You’ve got to write about this cool piece of tennis trivia,” or “There’s this really amazing baseball story your readers would love to hear,” and I’d kind of grin and nod and pretend to make a mental note, all the while thinking there could hardly be anything less interesting to write about than sports. However, when my son Ben suggested an article on sandboarding, I had to admit that did sound sort of interesting—and at least I didn’t have to participate in it. So in the noble spirit of contradiction, I set out to discover what I could about this sport. Sandboarding resembles snowboarding as seen through amber glasses. The general idea is the same; participants strap a short board to their feet and slide down a hill, only in this case the surface is sand rather than snow. Sandboarders sometimes say the experience is more like surfing than snowboarding, an impression undoubtedly enhanced by the lack of heavy clothing. As in snowboarding, the sport is sometimes recreational, sometimes competitive; some participants focus mainly on speed, others on acrobatics and tricks. But one of the biggest differences is that sand dunes don’t have lifts; to get to the top for a run, you must hike or take a four-wheel-drive vehicle (euphemistically known as a “chair lift”)—and a friend to drive it back down the hill. Unlike snow-covered mountains, sand dunes are constantly changing size and shape due to shifting winds, making fixed installations of lift equipment impossible. The sandboards themselves are superficially very similar to snowboards, which is to say they’re about the same size and shape, and use similar bindings. However, since sand is much more abrasive, and with much higher friction than snow, some modifications are necessary to keep the boards running smoothly and to keep them from getting chewed up rapidly. The bottom surface of most sandboards is covered with a tougher, more slippery material than wood—often Formica or ABS plastic, though stainless steel is sometimes used as well. The choice of material must be matched to both the type of sand on which it will be used and the intended effect (lighter materials for acrobatics, slipperier ones for speed). Some riders wax their boards to reduce friction further and prolong the life of the board, but even under the best conditions sandboards wear out even more quickly than snowboards. I initially assumed that sandboarding was a recent invention, a simple snowboarding knock-off. This is only approximately correct, however. On the one hand, sandboards have appropriated snowboard technology, and attracted snowboard riders, only in the last few decades. But there is evidence that ancient Egyptians were sliding down sand dunes on pieces of wood or pottery 3,000 years ago. Modern, upright sandboarding is believed to have been invented in Brazil in the 1940s. In recent years, though, advances in materials and techniques have led to much faster speeds and longer jumps than ever imagined before—professional sandboarders routinely reach speeds in excess of 60 mph (100 kph) and jump distances of 50 feet (15m) or more. 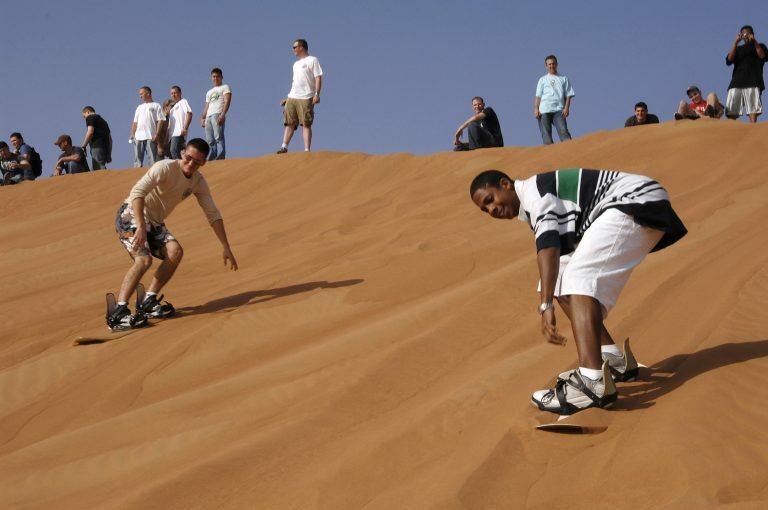 Sandboarding can be done anywhere there are sand dunes—which is a surprisingly large number of places. Certainly the deserts of Africa, Australia, and California are natural choices, but suitable sand dunes can be found all over the world—from Chile to the Athabasca sand dunes in Saskatchewan, Canada, from China to North Wales. The international sandboarding championships are held annually in Nurnberg, Germany, attracting as many as 50,000 fans. Florence, Oregon is the proud home of the world’s first sandboarding park, called Sand Master Park. I should perhaps mention that, as sports go, the ones that involve standing on a board and moving very fast are among the last I’d personally be inclined to try. Whether the surface is water, snow, concrete, or sand, that whole mode of movement just doesn’t appeal to me. I do like the idea of sandboarding, especially the fact that it’s not as commercialized as snowboarding. But I think I’ll start out with sand tobogganing—or maybe just hold out for the 3D force-feedback sandboarding computer game, undoubtedly coming soon. Note: This is an updated version of an article that originally appeared on Interesting Thing of the Day on July 15, 2003, and again in a slightly revised form on February 13, 2005.